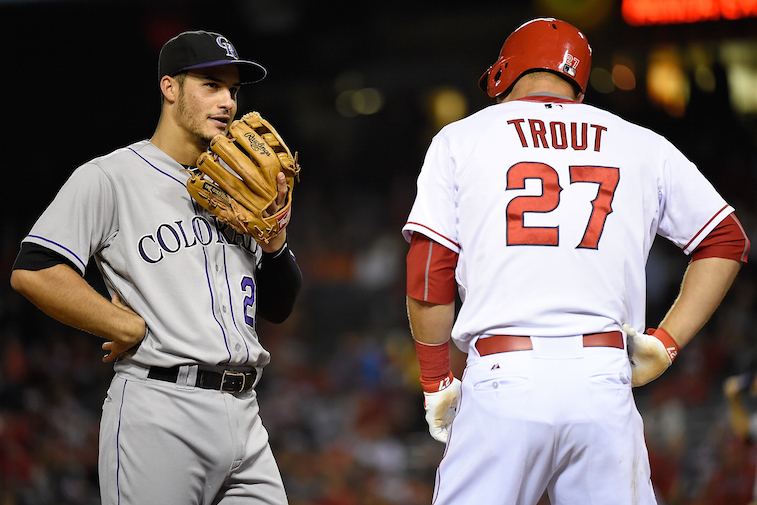 MLB: Is Nolan Arenado On the Same Level as Mike Trout or Bryce Harper? On paper, the Colorado Rockies’ everyday lineup is one of the most talented groups in baseball. If you don’t believe us, just consider the fact that three out of their four starting infielders – D.J. LeMahieu, Troy Tulowitzki, and Nolan Arenado – made the National League All-Star team this year, and their fourth starting infielder, Justin Morneau, who has been injured for most of the season, was the 2014 N.L. batting champion. On top of that, two of their three starting outfielders – Carlos Gonzalez and Charlie Blackmon – have also made at least one All-Star team. Knowing this, you may be asking yourself the following question: “if they have so much talent, why are the Rockies constantly finishing in the bottom of the N.L. West standings?” Well, the main reason is terrible pitching, but that’s a story for another day. One thing that is for sure, though, is that Arenado, the team’s starting third baseman, is not the problem. After being selected by the Rockies with the 59th overall pick in the 2009 MLB Draft, Arenado quickly emerged as one of the top prospects in the organization. Much to his chagrin, the Rockies kept the California native in the minors on a full-time basis until the 2013 season. The 24-year-old is entering his third full season in the Big Leagues, and is quietly emerging as one of the best young players in the game. In fact, he may be the best player you’ve never heard of. Arenado’s defensive ability is so jaw-dropping that it often overshadows the fact that he has developed into one of the premier offensive players in the game, as well. In 2014, he hit .287 with 18 home runs and 61 RBI in 111 games. 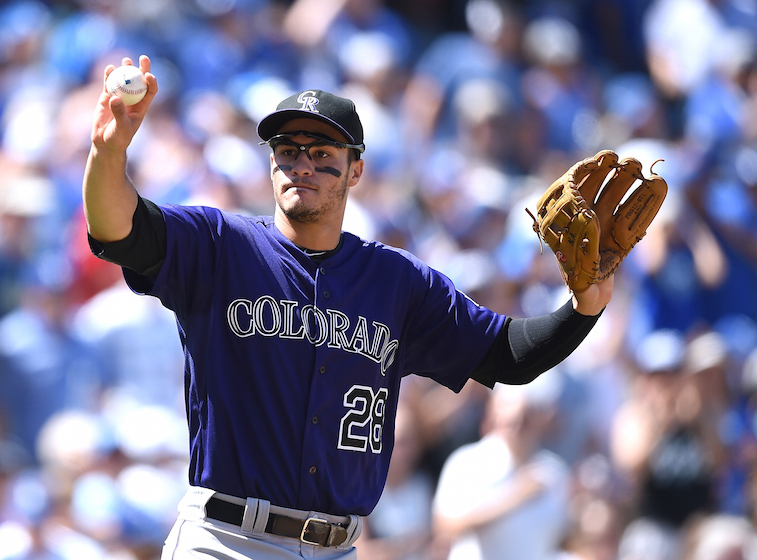 At the midway point of the 2015 season, Arenado is batting .293 with 24 home runs and 70 RBI. That has the 2015 All-Star on track to finish the season with a batting average close to .300, over 180 hits, just over 45 home runs, and more than 130 RBI. When you combine that with his Gold Glove-caliber defense, you have the makings of a legitimate N.L. MVP candidate. It is highly unlikely that Arenado will get serious MVP consideration due to the lack of success for the Rockies and the fact that he plays half of his games in the thin air of Coors Field in Denver, CO. In reality, the Coors Field argument actually shouldn’t apply to Arenado, as he has hit 15 of his 24 home runs in 2015 during road games, but that too is an argument for another day. In looking at the big picture of things, his performance this season has us wondering, why is Arenado not being mentioned with the likes of Washington Nationals outfielder Bryce Harper and Anaheim Angels outfield Mike Trout as the best young players in Major League Baseball? Trout, 23, is widely considered to be the best overall player in the game today. Offensively, he can do it all. He has power, hits for average, and can steal bases. Defensively, he may not have a Gold Glove to his name, but there is no denying that Trout is one of the best fielding centerfielders in baseball. Honestly, there is really no arguing that Trout is the best player in baseball. Likewise, many people consider Harper, 22, to be the best overall hitter in the game today. He has a legitimate chance to contend for a Triple Crown in 2015. While he has always been known for his raw power, Harper is now showing patience at the plate, which has led to his batting average jumping up to .339 this season. What Harper doesn’t do, is play defense at the level of Trout or Arenado. We’re not saying he is a horrible defensive player, but we simply don’t see Harper ever winning a Gold Glove as an outfielder. We’re here to tell you that Arenado has played himself into the same class of player as Trout and Harper. We’re not saying he is a better player or more valuable than either player, but he is now one of baseball’s truly elite players. If raw statistics don’t convince you of this, just tune into a Rockies game during the second half of the season and see for yourself. All statistics courtesy of Sports-Reference.